The Lost and Found Pets Ireland Latest Listing gadget is now published for all those using a customised iGoogle homepage. The gadget automatically lists up to 5 of the latest listings on the site and the listings displayed can be filtered by status (lost or found), county and pet type. It is also worth mentioning that this kind of Google gadget can be embedded in any other web page with just a couple of lines of cut n’ paste code. For more see The Lost and Found Latest Listings Gadget page in the iGoogle Content Directory. More as an experiment at this point than anything else, given the limited user base on Google Wave at this point, I have started certainly Ireland’s and possibly the world’s first ‘Lost & Found Pets’ public Google Wave. I’m hoping those using Google Wave will use this wave as a resource for sharing information on lost, missing, stolen and found dogs, cats and other pets in their particular area. Time will tell how useful this resource will be. 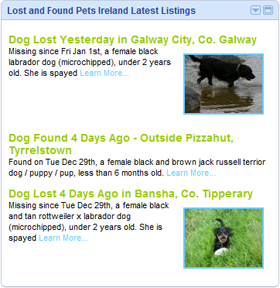 You can jump on this wave now by heading to The Lost and Found Pets Ireland Public Google Wave. As always, let us know what you think and if you have any ideas for features you would like to see on the Wave, let us know.